The most important newspaper of Argentina published the following report after 4 month with trial by jury in the Province of Buenos Aires. Changes in our Justice: The Jury convicted in 7 cases and acquitted in the other 6. Composed of 12 neighbors. They rendered verdicts in murder cases, robberies and one case of sexual abuse. 80% of the decisions were unanimous. Four months after the introduction of lay participation in trials of the Province of Buenos Aires, chance determined that at least the first 13 verdicts can be understood as an allegory of the classic symbol of justice: a balance. This because between the first trial, held in March in San Martin, and the last one, held in San Isidro days ago, the jury decided in seven occasions that the accused were guilty, whereas in the other six cases the jury understood they were not. The jury, composed of twelve lay citizens, faced several different types of cases: five homicides, three attempted murders, four robberies aggravated by the use of weapons (one of these was carjacking) and attempted sexual child abuse in big cities and small towns like Pergamino, Lomas de Zamora, Tres Arroyos, Necochea, San Isidro, Junín, Tres Arroyos or La Matanza. In each case, they decided according to what they heard during the trial and based on the evidence presented by the parties. As the system establishes, when the jury convicts, the judges carry on with the sentencing process and decide the amount of the penalty. In three of the murder cases, the accused were declared guilty and, in the remaining two, they were found innocent. In the first jury trial of the Province of Buenos Aires, held in San Martin last March, the verdict of the 12 jurors -composed with citizens like a pedicurist, a glazer, retirees and even a scientist and originally drawn by their ID number from the voting lists- benefited the defendant, Guillermo Barros (age 28), who was accused of killing his former brother in law Gabriel Armella (age 30) in 2014. It was after almost two hours of deliberation, after which the jurors rendered a unanimous decision: not guilty. However, in trials conducted in La Matanza and Necochea, jurors determined that the defendants were guilty. The Necochea case is, so far, one of which involved the harshest punishment. Two days after the jury´s verdict, Judge Mario Juliano imposed a penalty of 14 years imprisonment to Nahuel Gandulia (age 23), who shot Carlos Lolli (aged 22) in the nape, and who died after nine days of agony. The trial had moments of tension and insults from family members of the accused to the victim´s family. However, Judge Juliano was satisfied with how the hearing was held. "I was sure that the people would decide as they should. It did not cross my mind how would I personally ruled in the case. I was convinced that there was the citizenship, six women and six men with different social backgrounds, who were deliberating for two hours. It is the sovereign´s decision", he said days after the trial. 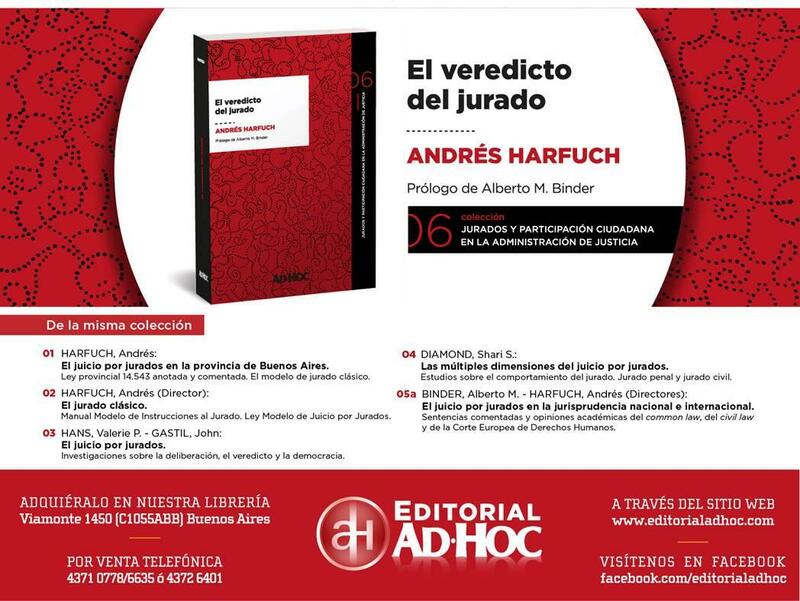 From the Argentine Association of Trial by Jury (AAJJ), they detailed that, at least during the first 13 trials, the average length of the discussions was of two and a half hours. And that in more than 80% of the cases, the jury's verdict was unanimous. "The response from the jury -and the seriousness and responsibility with which they assumed their service- was exemplary and moving," as Andrés Harfuch, vice-president of the AAJJ and chief of public defenders in the courts of San Martin, explained to Clarin. The average time of the proceedings did not apply in the first trial of this kind conducted in Junin last May. In that city, a record was established: the 12 person jury discussed until midnight to conclude that Ariel Gimenez (age 22) was guilty, but not for the attempted murder as charged. The jury determined that he should be found guilty of a lesser included ofence: assault with serious bodily harm to Ivan Sarrachini (age 35). , "At the end of the trial, the prosecution asked me to instruct the jury that, whether they understood that the defendant did not wanted to cause the death, they could find him guilty of assault. This ended up facilitating the decision" said judge Miguel Angel Vilaseca, who considered the verdict as "fair". A similar situation occurred at the trial held on April 13 in Lomas de Zamora, where Walter Fabian Acuña Prost was convicted of gun robbery. But as the jury determined there was not enough evidence of the proper operation of the gun, they ended up convicting the defendant of the lesser included offence of simple robbery. As part of the paradigm shift in the province of Buenos Aires, the Government announced weeks ago that, based on an agreement between the Ministries of Justice and Education, the Province will introduce in the last years of secondary school new contents about jury trial. 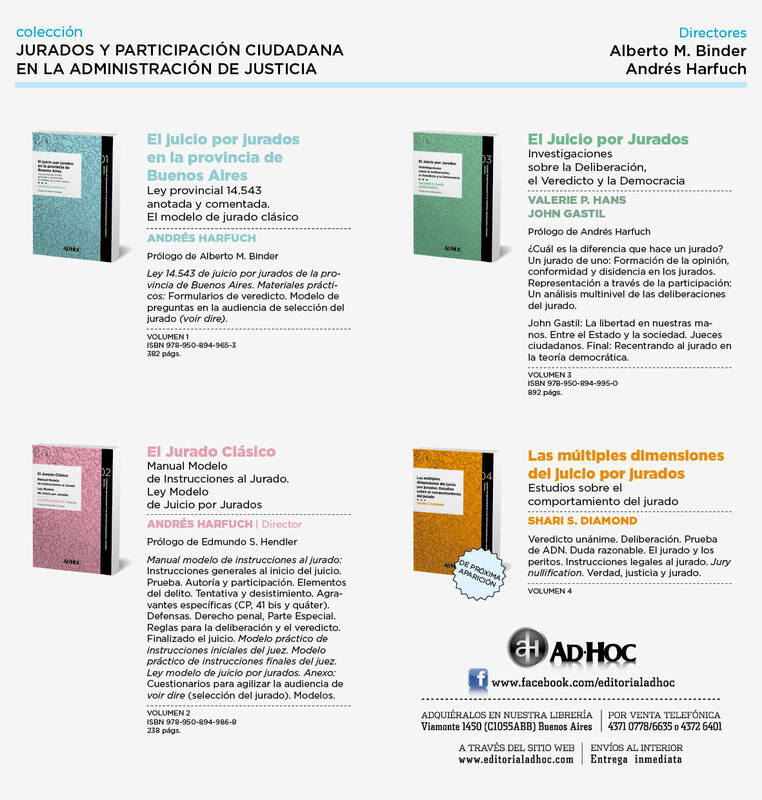 It has been called “Citizen Manual for Jury Trials" and will be distributed among 400.000 students. According to sources from the Ministry of Justice, the material "addresses in a didactic way the requirements that every citizen must meet to be jurors and how they are selected, how is the development of a trial of this kind, the functions of each of the actors in this process ". 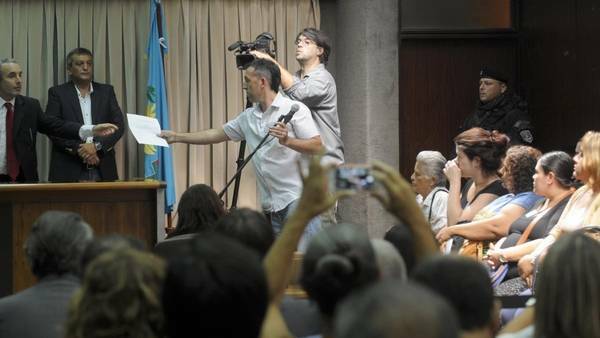 The manual also describes how was the development of the first jury trial in the Province, held in March of this year in San Martin, and "the perception of those citizens that have participated," according to sources from inside de Ministry. Minister Ricardo Casal, assessed that "this is an initiative that aims to train those who in a few years can became potential jurors." The mayor of Mar del Plata, Gustavo Pulti, is proposing a broad reform concerning both the regulations and the service of the Municipal Contravention Justice. To that end, he submitted a draft ordinance which proposes to update various aspects of the legislation. The initiative proposes the creation of more courts, together with the implementation of new systems for the administration of Contraventions Justice and the resolution of neighborhood conflicts. The project intents to provide the municipal justice with new tools, such as conciliation between people in conflict due to municipal infractions. In addition, the draft ordinance incorporates as a core matter, the introduction of trial by jury, composed of 5 or 12 neighbors (depending on the seriousness of the contravention), who will be especially convened to issue a verdict on those causes that could not be resolved at a prior conciliation stage.